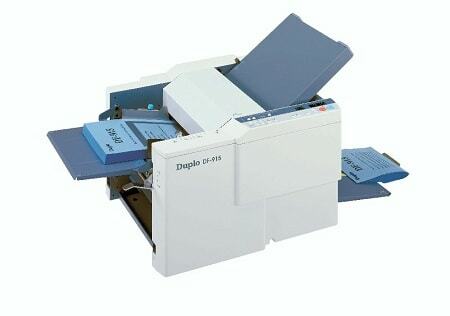 The semi-automatic Duplo DF-915 paper folding machine folds up to 280 sheets per minute. With six popular preset folds and a multitude of custom folds, crisp and accurate folding for a variety of applications is accessed at the touch of a button. The patented feed system ensures reliable feeding and accurate folds for a wide range of popular paper sizes, weights, and stocks. No manual adjustments are needed, as the DF-915 semi-automatic paper folder recognizes five popular paper sizes: letter, legal, ledger, 1/2-letter, and 1/2-legal.